“Infrastructure” in general can be defined as the components and equipment needed to operate, as well as the structures needed for, public works systems. Typical examples include roads, bridges, sewers and water supply systems.Various dams and infrastructural buildings have given Californians and the West the opportunity to control water, dating back to the days of Native Americans. 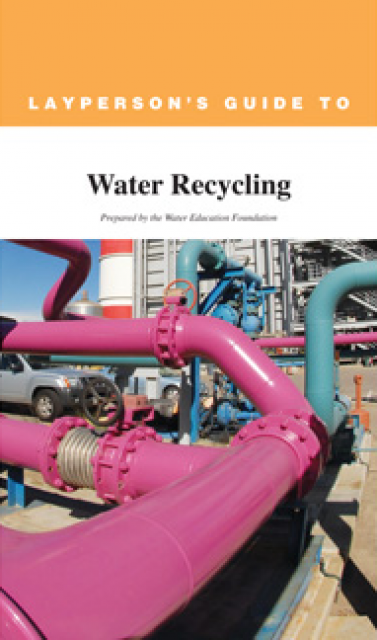 Water management infrastructure focuses on the parts, including pipes, storage reservoirs, pumps, valves, filtration and treatment equipment and meters, as well as the buildings to house process and treatment equipment. Irrigation infrastructure includes reservoirs, irrigation canals. Major flood control infrastructure includes dikes, levees, major pumping stations and floodgates. What’s thought to be the largest public works project in Sacramento County history will get underway soon — but at a bit less of a cost to the users. With the Inland housing market on the rebound and California in the fourth year of a punishing drought, local water officials need a reliable source of fresh drinking water now and in the future. Surface storage is the first and most important part of a comprehensive water solution. Even the areas of the state with the greatest potential to recharge groundwater require a steady supply of water to fill the underground aquifers. He’s [John Bess of Baltimore] searching for water leaks in the city’s [San Francisco] underground pipelines with a special microphone and earpiece that enables him to hear escaping water from the street — rather than having to dig down and find it. Sacramento utility officials say a common household item has the potential to create havoc on local sewer lines. During the widespread drought, officials are struggling to finish large-scale water infrastructure projects while populations are growing, drinking water resources are dwindling, and federal dollars are diminishing. Mayor Eric Garcetti’s call to strengthen Los Angeles’ water system — one pillar of his ambitious plan to ready the city for a major earthquake — would cost as much as $15 billion and require decades of work, Department of Water and Power engineers estimate. The Bureau of Reclamation was honored at the 2015 American Society of Civil Engineers Region 9 (California) Infrastructure Symposium and Awards Dinner on March 6, 2015. The Mid-Pacific Region was awarded the 2014 Outstanding Project Award for the development of the Red Bluff Pumping Plant and Fish Screen Project. After leaving his lucrative law practice, he [Harold Parichan] turned his attention to growing almonds on about 2,400 acres in the Central Valley. And it’s there that Parichan, 91, has a new opponent: the California bullet train authority. Claiming it is “doing the government’s job,” an environmental group this week finished posting online nearly 1,000 of the most complex public comments received last year on Gov. Jerry Brown’s plan to build Twin Tunnels beneath the Delta. Net federal public investment spending, both defense and non-defense, in 2013 (the latest year for which data are available) works out to zero as a percentage of gross domestic product, according to the Bureau of Economic Analysis’s National Income and Product Accounts tables. 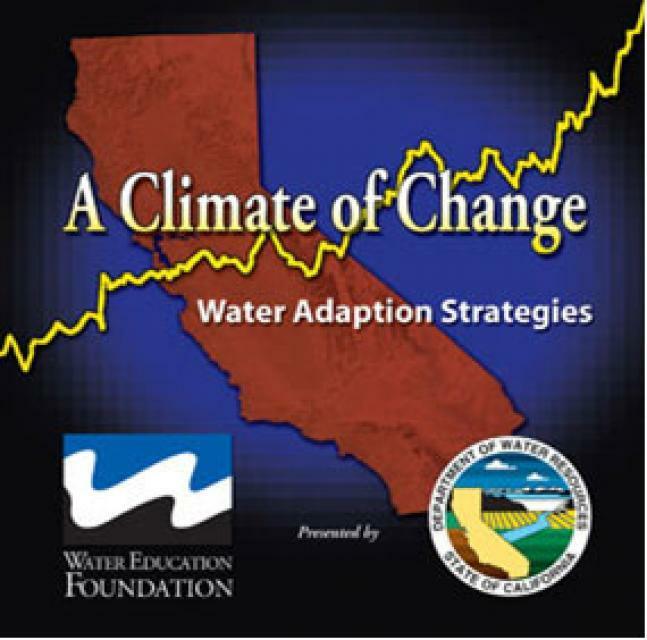 “Hope is not a strategy” when it comes to water supply, said Bryce Lundberg, chairman of the Northern California Water Association (NCWA). … At the top of his list is Sites Reservoir. The calendar may say it’s winter, but the sun is shining and the trees are already in bloom. Still the early spring-like weather isn’t enough to convince people in California that it’s time for something like a coast-to-coast water pipeline. As the morning light gently shines through brush, illuminating some sections of the Santa Ana River, biologists representing a consortium of water agencies slowly wade through the gently flowing waterway. The California Water Commission was born in a long-ago era, in a hopeful attempt to filter some of the politics out of the state’s most important natural resource. Caltrans has traded one wildlife problem for another in its dismantling of the old eastern span of the Bay Bridge — finding a solution to pesky cormorants that refuse to leave the bridge, but facing the possibility it is threatening a state-protected fish. Hoping to save money and time, the Pacific Grove City Council on Wednesday will consider adopting an ordinance that allows using a design-build approach on its local water project. The San Francisco Public Utilities Commission has opened a new 3.5 mile-long tunnel in Sunol Valley, a few miles east of Fremont, that will transport 265 million gallons of water a day, on average, to customers of the Hetch Hetchy water system. Dread over the water shortage in California has grown to the point that at least half the state’s residents are willing to relax environmental regulations and allow construction of water supply facilities in federal parkland, a statewide Field Poll has revealed. Top officials with the State Water Resources Control Board and the state Department of Water Resources took different approaches to emphasize that public health and safety will be the key issue when the [Fresno] City Council on Thursday evening debates the mayor’s plan. The great pioneers of Pasadena described the Hahamongna watershed and the Arroyo Seco as a place where trout swam in crisp waters, webs of flowery vines and oaks blotted out the sky and hunters scored bears and foxes for display in their Los Angeles homes. Tuesday night the [Sacramento] City Council approved a request from the City to install about 51,000 meters by 2020. The City of Fresno says if it builds the proposed southeast water-treatment plant, the water will come. Big projects like the High-Speed Rail and delta tunnels may have contributed to some voter criticism. As California’s drought drags on, officials are cracking down on thieves who wrench open fire hydrants and ignore or tamper with meters to access one of the state’s precious commodities – water. The poll comes as [Gov. Jerry] Brown, starting his fourth and final term, pursues two controversial infrastructure projects: construction of a $68 billion high-speed rail system and a pair of massive tunnels to divert water around the Delta to the south. The board of the Turlock Irrigation District will talk in closed session Tuesday about two major water projects in the offing. The message from park rangers, amateur metal detectors and regular fisherman at California’s Lake Perris is unanimous: the water is lower than they’ve ever seen it. A chorus of voices is starting to build, demanding accountability in state government, but so far a suddenly important state agency has been tone deaf. It’s time for Gov. Jerry Brown to start singing. The largest of three big pipelines that deliver water to 1.3 million East Bay residents has sprung a leak and is temporarily shut down for repairs. Elation. That’s how Woodland City Manager Paul Navazio described his feelings upon receiving, hand-carrying and then depositing into the city’s bank an $18.5 million check from the state Water Resources Control Board. Hazardous heavy metal levels in Indio’s “stand-by” water supply should be under control in time for summer with City Council’s Wednesday 5-0 approval of the $2.95 million-purchase of water treatment equipment. A nearly century-old water main burst in the Hollywood Hills in the predawn hours Wednesday, cracking sidewalks and pavement and submerging cars as at least 100,000 gallons of water spewed into a residential neighborhood. A water main break in the Hollywood Hills was flooding streets early Wednesday, leaving several vehicles in an underground parking structure submerged. Drinking water is flowing to Beijing from China’s controversial south-north water project – enough to fill 20,000 Olympic-size swimming pools in the first six weeks, the city reported Friday. Californians for Water Security, despite talking a good game on social media about fixing California’s aging water infrastructure, is actually supporting Gov. Jerry Brown’s $60-plus billion Delta tunnels project. The two Democrats see eye-to-eye on many things, but not on the train or the tunnels. Assemblyman James Gallagher, R-Nicolaus, introduced Assembly Bill 311 on Thursday to streamline the environmental review process for water storage projects funded through the 2014 Proposition 1 water bond. Carrying murky water in jars as samples, residents in Gardena on Thursday demanded answers from a water company about black, foul-smelling tap water that is pouring from their faucets, toilets and showers. … Golden State Water Company blames sediments from aging pipelines. When the last chunks of concrete from Glines Canyon Dam were ripped from bedrock in August and the Elwha River again touched its old course, the moment marked an engineering and environmental milestone: the completion of the largest dam removal in U.S. history. We should be building more low-elevation, off-stream storage such as the San Luis Reservoir in the Pacheco Pass west of Los Banos (which could be enlarged) or the proposed Sites reservoir in the foothills west of Colusa, which would hold about a million acre-feet of water. In total, California has $7.5 billion in bond revenue to work with. With a price tag of $2 billion, Sacramento’s new sewer project is set to begin. Former Huntington Beach Mayor Debbie Cook has filed a complaint with the state’s political watchdog, alleging that a water district board member has a conflict of interest and should not be allowed to vote on a proposed desalination plant on the city’s oceanfront. In his fourth and final term, Gov. Jerry Brown intends to start drilling two massive tunnels under the Sacramento-San Joaquin River Delta. Estimated cost: $25 billion. Dams are no friend to biodiversity. … But dams don’t have to be death knells of biodiversity. There’s a lot of wait-and-see involved with Sites Reservoir. The proposal for the off-stream reservoir on the Colusa-Glenn county border has been around since at least the 1980s. Sites Reservoir is in a holding pattern as project leaders wait for the state to settle on regulations for distributing funds from last year’s $7.5 billion water bond. From building a tunnel connecting two south county reservoirs to clearing the Salinas River and dealing with its half-century-old river diversion permit to managing the Salinas Valley groundwater basin — not to mention the promise of a recently approved $7.5 billion state water bond — Monterey County and its water resources agency are facing an unprecedented number of crucial water-related issues. Two discussions that play a large role in the future of California’s water systems begin this week. … The two meetings are the highest profile examples of discussions that are taking place in California communities large and small. The collapse turned an approximately 150-foot section of bridge into a giant pile of sticks and steel and dumped wet concrete — which is toxic to fish — into a stream. The areas with the largest gaps between needed and available funding are stormwater upgrades, street lights and sidewalks. A second large oil spill into Montana’s Yellowstone River in less than four years is reviving questions about oversight of the nation’s aging pipeline network. For thousands of years, city planners have engineered water into submission — think aqueducts. …And so there’s a call now to build cities like sponges. Work to replace aging, leak-prone pipes in Belvedere, Tiburon, Ross and San Anselmo is underway after the rains caused delays. Thousands of gallons of clean water will flow into streets in the coming weeks. Don’t be alarmed: It’s a sign that drought conditions are easing, according to water officials. Los Angeles leaders are hoping to use a new tax-sharing law to help finance ambitious plans to transform the city’s namesake river into a ribbon of recreational areas and vibrant new developments. The U.S. Environmental Protection Agency launched the Water Infrastructure and Resiliency Finance Center today to help communities across the country improve their wastewater, drinking water and stormwater systems, particularly through innovative financing and by building resilience to climate change. In his State of the State and inaugural address, Gov. Jerry Brown reflected on the “eerie resemblance” between the challenges his father faced and those we grapple with today. Gov. Pat Brown’s California responded to the water crisis of his day with a massive undertaking, building the State Water Project. The Bureau of Reclamation has scheduled an informational meeting to present updates on the Upper San Joaquin River Basin Storage Investigation. This meeting will address potential impacts to residents and landowners from the proposed construction activities if Congress authorizes the project. Plans for a long-sought municipal aquatic center in Windsor were introduced this week by the Lytton Band of Pomo Indians, who are willing to pay to build it in exchange for obtaining water and sewer service to the tribe’s planned housing project. A group calling itself Californians for Water Security launched a public relations campaign today in support of Gov. Jerry Brown’s twin tunnels project. Crews are scheduled to begin preliminary work on a nine-foot-tall dam on the north side of Folsom Lake Thursday. From New England to the Pacific, states across the country are taking new interest in the loss of drinking water from public water systems, and adopting sensible policies for communities to report and reduce these losses. DC Water dedicated its second Tunnel Boring Machine (TBM) on December 12, 2014. It has been named “Nannie”, in honor of Nannie Helen Burroughs, a prominent 20th century African-American educator, civil rights activist, and Washington resident. This TBM will join another – called “Lady Bird” – as part of Washington’s strategy to reduce combined sewage overflows into the Anacostia and Potomac Rivers when it rains. Earlier today [Jan. 9], Governor Brown proposed his balanced budget that increases funding for schools and health care coverage, holds college tuition flat and delivers on the propositions approved by voters last November by starting investments in water projects and saving money, while also working to reduce the state’s other long-term liabilities, according to the Governor’s press release. One of the earthen dikes that forms Folsom Lake will undergo repairs, starting Tuesday, to prevent seepage. After three years of drought, water shortages and the impact on agriculture show that California’s system of delivering water is troubled. The voter-approved $7.5 billion water bond will help. But whoever replaces Boxer must be steeped in water policy and able to deliver federal aid back home. Soquel Creek Water District leaders said Tuesday they want to conduct a districtwide survey of all customers before pursuing a binding vote on how to increase the water supply. Board members said they don’t want to ask voters to support a project or series of solutions without a sense of what customers want. Gov. Jerry Brown kicked off his unprecedented fourth term Monday with an appeal to lawmakers to confront California’s greatest challenges … Overall, Brown had little to say about his more costly and controversial projects including high-speed rail and his two-tunnel plan for redirecting water resources to the Central Valley. Gov. Jerry Brown, sworn in Monday for a fourth and final term, called in his inaugural address for sweeping changes to fight climate change and for renewed spending on California’s aging infrastructure. [Gov. Jerry] Brown is focused, at least in part, on endeavors that would outlast him: a bullet train linking the Bay Area with Los Angeles, a proposal for twin tunnels to move water around the state, bolder efforts to battle climate change. He ties these forward-looking projects to the pioneering drive that led his ancestors to California. Aquafornia news December 23, 2014 KQED Public Media for Northern Calif. The coastal tourist town of Cambria, located just below Big Sur and adjacent to Hearst Castle on California’s central coast, will begin pumping about 300 gallons a minute of treated water into the local aquifer this week. The new water source is part of a controversial emergency solution—built just this fall—to keep the community from running dry. Despite its fundamental and multifaceted role in maintaining national growth and economic health, infrastructure in the United States has not received an adequate level of investment for years. The [San Francisco Public Utilities] commission’s Regional Groundwater Storage and Project with Daly City, San Bruno and California Water Service Co., which serves South San Francisco and Colma, would store water that could be used during emergencies such as a drought or earthquake, SFPUC officials said. The Carmel River had just begun flowing after the recent rains, prompting Lorin Letendre and several others to hike up to a ridge above the San Clemente Dam in Monterey County this past week to see the surging stream. … The new river channel will allow workers to take down the dam structure next year without worrying about a catastrophic mudslide. The “Eagle has landed” moment came at the start of Wednesday’s Southern Nevada Water Authority board meeting, when engineering director Marc Jensen stood to announce what many people in the room were already buzzing about. Los Angeles Mayor Eric Garcetti on Monday proposed the most ambitious seismic safety regulations in California history — rules that would require owners to retrofit thousands of buildings most at risk of collapse during a major earthquake. … Garcetti is also proposing sweeping plans to protect aqueducts that supply L.A. with water and ensure firefighters won’t be left helpless by ruptured pipes as fires burn through neighborhoods. Some DWR projects are so big they almost take on a life of their own. The New Calaveras Dam construction project near Fremont has a history dating to the 1920s, when the dam now being replaced was built over a partially completed dam that collapsed during construction in 1918. A day after heavy rains opened up a massive sinkhole in San Francisco’s Richmond District, the city on Thursday continued with efforts to repair the 20-by-20-foot crater, while revealing it was caused by water flowing from a broken storm drain line. Most of us have never really considered the vast amount of infrastructure needed to bring water from its source to your tap. In reality, the network of pipes, pumps, power generators, reservoirs, and fixtures responsible for delivering drinking water is massive. A new Sacramento River water intake that will serve Woodland and Davis has been approved for a $2 million state grant to build fish screens to protect migrating salmon and steelhead. More than two-thirds of California voters authorized the state to borrow more than $7 billion to improve a water system strained by more than three years of drought. 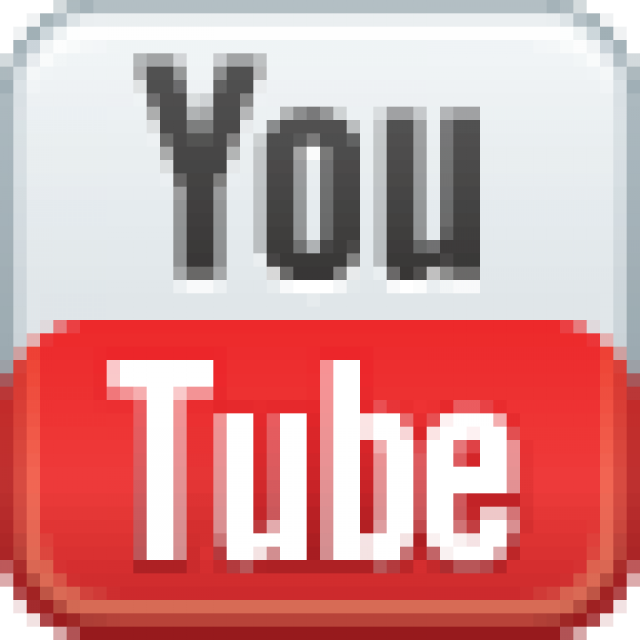 Now the difficult job of smartly targeting problems and effectively implementing projects is beginning. A canyon road in Beverly Hills will remain closed for about seven hours as crews repair a water main break and clean up after flooding. The San Joaquin Valley campaign for Temperance Flat Reservoir may have moved forward on federal drawing boards, and it may have gotten a shot of adrenaline when the $7.5 billion water bond past this month. But the public money is not committed here yet. On a recent day after a rainstorm, several dozen fall-run Chinook salmon trying to migrate upstream in Auburn Ravine found their progress frustrated. Efforts to complete their long spawning run from the Pacific Ocean were halted by a small dam on the outskirts of Lincoln. Voters just approved $7.5 billion dollars for new water storage projects, but a new study says it’s likely not all projects will be worth the money. Novato faucets spouted some rust-colored water a couple times this week in incidents that affected up to 15,000 customers in the North Marin Water District. Nothing seems to beat the fascination my boys and most young kids seem to have with water fountains. … Most schools and child care facilities receive their drinking water from nearby public water systems. … Water pipes and plumbing fixtures in school buildings can affect the quality of the drinking water. Marin’s oldest water storage structure — dating back to the 19th century — is getting a $3 million revamp. How old is it? California Governor Jerry Brown welcomed representatives from western states to Sacramento today for the Western Governors’ Drought Forum. And Brown took some time to share his thoughts on moving water around California. With the resounding passage of the $7.5 billion state water bond, Sites Reservoir supporters are confident the storage project will be erected in Colusa County, although its completion could still be imperiled by competing projects and environmental backlash. Good for the Sites Joint Powers Authority. 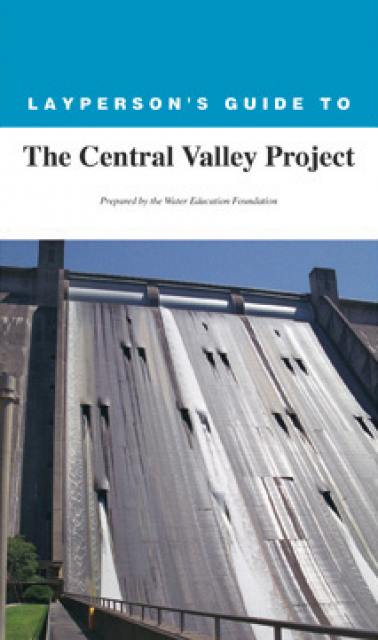 The group of Sacramento Valley leaders and water district personnel is working on further planning and financing for the off-stream reservoir proposed to be built at the border of Glenn and Colusa counties. The Los Angeles Department of Water and Power (LADWP) is testing water pipes that have been very successful in Japan, even following major earthquakes. A Marin Municipal Water District water line broke Wednesday afternoon sending water gushing onto Tunstead Avenue and into businesses in San Anselmo. … The rupture of an 8-inch cast iron line that dates back to 1969 occurred at about 3:30 p.m. According to the California Department of Fish and Wildlife’s Marijuana Enforcement Team (MET), in the last two years, illegal marijuana grows have stolen 1.2 billion gallons of water. … Just this year, wardens from Fish and Wildlife’s MET have uncovered 136 dams, reservoirs and elaborate piping systems set up by pot growers to steal water. Californians, you just voted yourselves a $7-billion-plus water bond measure. What happens now? 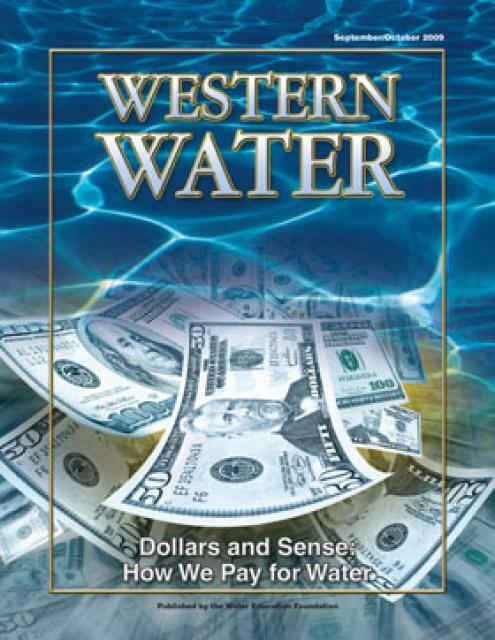 Lester Snow can draw you the map of water needs and detail the money being spent. Measures to spend public money for water infrastructure, pollution control, and environmental protection scored more victories than defeats yesterday at the ballot box. A day after passage of bond measure Proposition 1, water experts said it was too soon to say exactly how the gusher of tax dollars will be spent — but they envisioned new pipelines in Bay Area neighborhoods, groundwater cleanup in the San Fernando Valley, clean tap water in East Porterville, creek protections in the Sierra and a new dam on the San Joaquin River. Friday’s Top of the Scroll: How will Proposition 1 money be spent? California’s passage of a $7.5 billion water bond is not an end, but a beginning. … Joining us to explain what Californians need to know about the future of these water funds is Andrew Fahlund, deputy director of the California Water Foundation. As Los Angeles struggles to fix its decrepit water system, officials are most concerned about 400 miles of pipes that they say pose the greatest risk of breaking and causing major property damage. 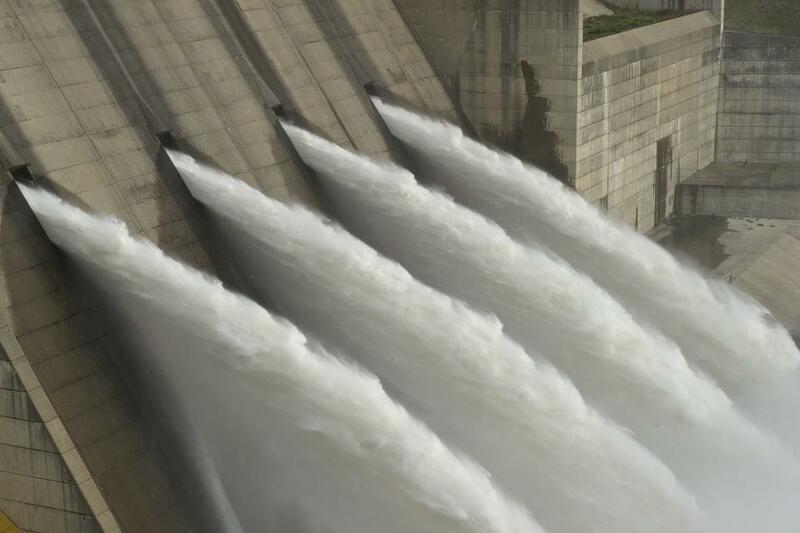 California’s newly approved $7.5 billion water bond will energize the state’s efforts to deal with a host of water problems by channeling money to a list of broadly defined categories of projects. [Gov. Jerry] Brown will face a series of challenges as he presses forward. There’s vocal opposition to a $25-billion proposal for massive tunnels under the Sacramento-San Joaquin Delta, a project the governor has pitched as crucial to the state’s water system. If the dollars flow in the intended areas, the newly approved water bond and rainy-day fund both have the power to improve California’s economy, local business leaders said Wednesday. California’s aging water infrastructure and collection of ecosystems will receive a $7.5 billion injection of taxpayer dollars, as voters on Tuesday approved a sizable bond that had become a priority for lawmakers and the governor. The trees are a symbol of the drought’s effect on the relatively isolated Central Coast, which — despite its proximity to the world’s largest body of water — is particularly vulnerable to shortages because it relies on an unstable networks of creeks, lakes and State Water Project allocations. When Californians close the musty drapes of the voting booth on Tuesday, they will face a $US 7.5 billion question: Should the perpetually water-worried state, in the midst of a record drought, use its taxing authority to pay for another set of state-funded water projects? 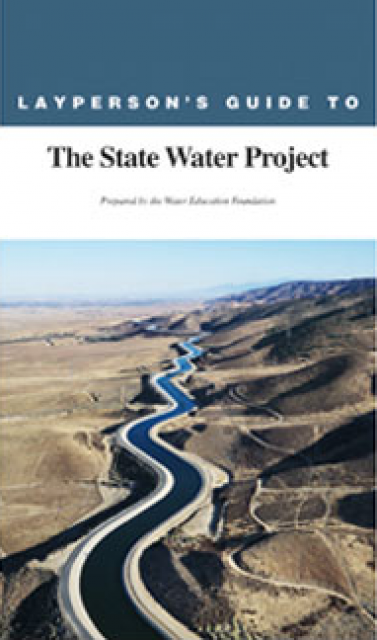 If the voters say yes – as the polls suggest is likely – Proposition 1 will be the seventh and most expensive water-related bond passed in California since 2000. In a new report, the Center for American Progress takes a look at the danger climate change poses to wastewater systems from stronger storms, higher seas, and heavier downpours and offers realistic and cost-effective recommendations to shore up this aging infrastructure before the next massive storm. Chief among those recommendations are that all new investments in wastewater infrastructure take into account the projected impacts of climate change and that affordable, green infrastructure solutions be considered. ‘Stockton East now ‘swimming’ in storage,’ sang the headline in Monday’s Record. Well, kinda. California voters have turned against two health-related measures on Tuesday’s ballot while majorities continue to support a water infrastructure bond and a criminal sentencing initiative, according to a new Field Poll. For the past half-century, California has fallen behind in adequately planning for our water future by not investing in water storage and improved infrastructure. This failure, combined with the persistent drought, has led to the current statewide water crisis and threatens the future of our agriculture. A showdown over whether to employ state legislation requiring union-backed labor protections on the Interlake Tunnel project continued Tuesday even as a status report indicated the project cost has nearly doubled. Vandals have left graffiti covering the Barker Dam in Joshua Tree National Park. A month of water debate has delivered an unsurprising message to Fresno City Hall — given their druthers, people prefer stuff to be free. But the 150 people who gathered at Gaston Middle School in southwest Fresno on Monday for the third of four water forums got an equally unsurprising reply: Water is the stuff of life, and it’s going to cost you. A water main break will continue to affect the busy Hollywood intersection of Santa Monica Boulevard and Highland Avenue on Tuesday after a second rupture occurred just as repairs were wrapping up overnight, utility officials said. The Stockton East Water District recently finished a new concrete-lined reservoir that helps secure Stockton’s water supply and also prepares for the city’s future growth. An in-depth analysis of the $7.5 billion water bond (Proposition 1) on the Nov. 4 ballot finds that it could benefit California’s communities and the environment but that those benefits (water supply, water reliability and environmental quality improvements) are not guaranteed. The Bureau of Reclamation has released a report summarizing six years of testing coatings to control the attachment of quagga and zebra mussels to water and power facilities. 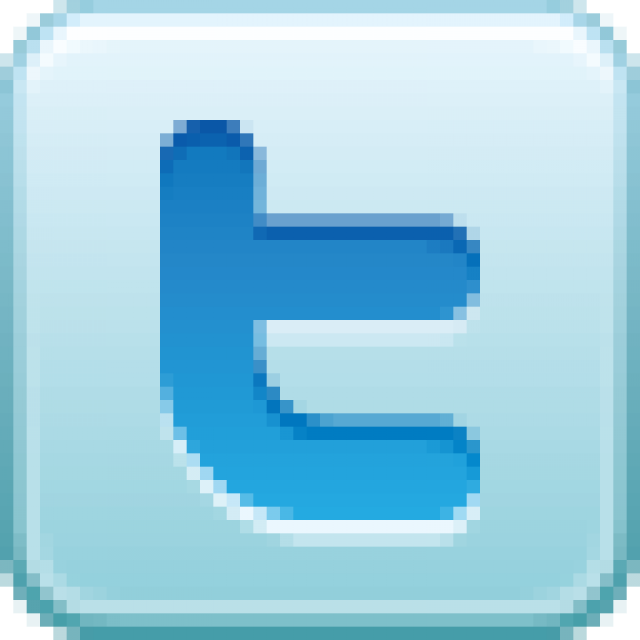 … The testing was conducted at Parker Dam on the Colorado River. This drought year, as in those past, California water regulators have given away to cities and farms some river flows critical to fish and wildlife. … There are, however, legal backstops to prevent harmful reductions in fish flows, even during a drought as severe as this one. A screening of California’s more than 1,400 dams has found that 181 dams are potentially imperiling native fish downstream. A plan by PG&E to temporarily shut down a powerhouse that feeds water from the Eel River to the Russian River may cut into consumer supplies this winter by further reducing the amount of water coming into Lake Mendocino. The Los Angeles County Department of Public Works plans to remove 2.4 million cubic yards of sediment from behind the Devil’s Gate Dam over the next several years, according to the final environmental impact report (EIR) for the project released Monday. Turns out the UCLA flood was just a drop in the sea of potable water that leaks or blows out of underground pipes. California’s water distribution systems lose up to 228 billion gallons annually, the state estimates — more than enough to supply the entire city of Los Angeles for a year. The venerable water utilities of the United States, the essential guardians of public health and enablers of economic growth for more than two centuries, are showing signs of significant wear. Readers asked a very good question last week about the proposed $2.6 billion reservoir project that would more than double the capacity of Millerton Lake. 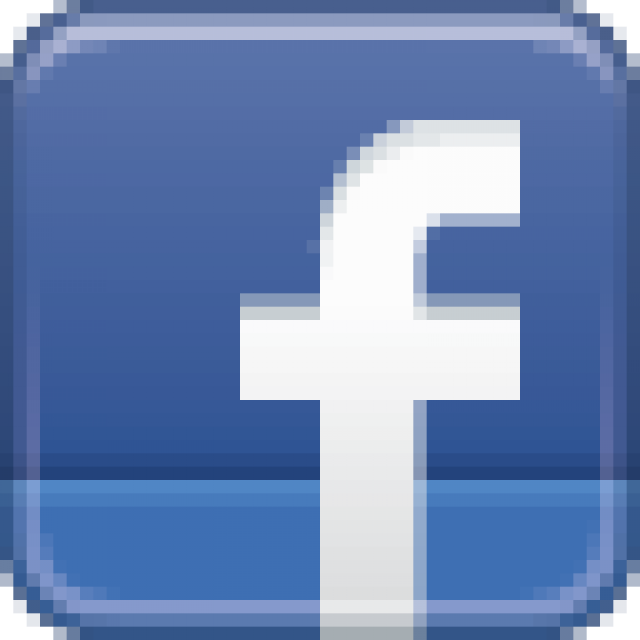 Battles over water rights, wet years flowing into dry ones, Jerry Brown gubernatorial tenures – in California, some storylines recur. Proposition 1 could lessen future water shortages, but at what cost? Step by step, sewage flows through the city’s Donald C. Tillman Water Reclamation Plant in the San Fernando Valley. 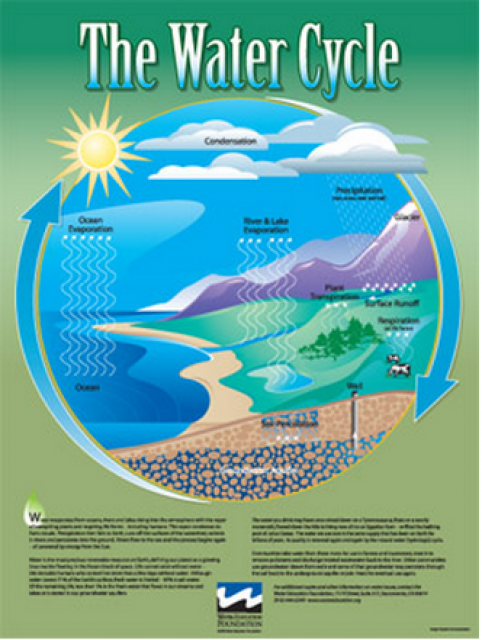 Ultimately, the cleaned effluent flows into lakes and rivers. … Mayor Eric Garcetti, who prefers the term “showers to flowers” instead of “toilet to tap,” also lobbied for groundwater cleanup funds. Could desalination solve California’s water problem? Along this patch of the Pacific Ocean, welders and pipefitters nearly outnumber the surfers and sunbathers. … They are building the Carlsbad Desalination Project, which will convert as much as 56 million gallons of seawater each day into drinking water for San Diego County residents. Water, water everywhere, nor any drop to drink. That line is all that remains in my brain from an early exposure to “The Rime of the Ancient Mariner,” the endless poem that has been cruelly inflicted upon generations of American schoolchildren. 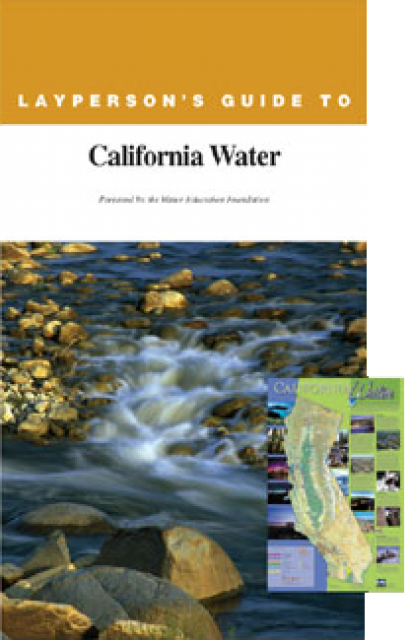 The California Water Foundation has released an informative site on the various projects that would be funded under this year’s $7.5 billion water bond proposal. Twenty-five years after the Loma Prieta earthquake, people in Marin are getting more serious about being prepared — and the Napa temblor that sent a jolt through the county this summer helped. About 100 people listened at a public meeting in Fresno to sometimes passionate statements from speakers who faulted everything from the feasibility analysis to the notification for the hearing on the draft Environmental Impact Statement for Temperance Flat Reservoir. The reduction of water use in new homes has long been a focus of California’s homebuilding industry. … The good news is the state has a golden opportunity to use the emergency drought funds available to retrofit older homes to comply with current building standards – potentially saving hundreds of billions of gallons a year. 25 years later, could Bay Area take another quake? It’s been 25 years since a massive quake rocked the Bay Area just before a World Series game … There have been about $30 billion worth of upgrades made to roads and water and telecommunications systems. A massive earthquake in Southern California could economically cripple the Los Angeles region, earthquake “czar” Dr. Lucy Jones warned City Council members during a hearing Wednesday. … A seismologist with the U.S. Geological Survey, Jones is working for the city for free for 12 months, helping craft a report on earthquake preparedness in building safety, water issues and communication systems. The U.S. Environmental Protection Agency announced $5.4 million in funding to invest in Northern Calif. tribes’ environmental programs, water infrastructure development, community education and capacity building. The announcement was made at the 22nd annual Regional Tribal Conference in Sacramento, Calif. The U.S. Environmental Protection Agency announced $5.4 million in funding to invest in Central Calif. tribes for environmental programs, water infrastructure development, community education and capacity building. The announcement was made at the 22nd Annual Regional Tribal Conference in Sacramento, Calif. The U.S. Environmental Protection Agency announced $5.6 million in funding to invest in Southern Calif. tribes for environmental programs, water infrastructure development, community education and capacity building. The announcement was made at the 22nd Annual Regional Tribal Conference in Sacramento, Calif. If state voters approve a water bond on the ballot next month, Monterey County would be in line for $12.5 million for the Interlake Tunnel water storage project, Assemblyman Luis Alejo said Tuesday. This week, the $288 million tunnel begins carrying the Bay Area’s water supply from the Hetch Hetchy Reservoir in Yosemite National Park to the Peninsula, bolstering the dependability of the region’s water system. Approaching the end of the second year of the San Clemente Dam removal project — the largest of its kind in state history — California American Water and Granite Construction will offer a progress update at a public meeting Tuesday night. Cattle and sheep have grazed on the floor of the Antelope Valley for more than a century. But just a few years from now, the land could be transformed into the bottom of a vast inland sea. A popular rock climbing area and other recreational facilities on the southeast side of Lake Perris will be closed for three years starting this week so that seismic work can begin on the dam, state officials said. An extensive Bay Area News Group survey of our infrastructure offers much reassurance: Major water pipes are now designed to bend, not break. … But our readiness to recover from the Big One gets far from a perfect score — more like a C-plus, say experts who study quake preparation around the globe. Storage was the key sticking point in getting the legislature to pass the water bond with the two thirds vote it needed. That portion of the bond includes reservoirs and projects to clean up or store more groundwater. We talked the other day about the most exciting project now going on in California, public or private. That would be Poseiden Water’s Carlsbad desalination plant north of San Diego, scheduled to begin operating next year. Nearly an inch of rain, with more wet weather forecast for the weekend, has helped firefighters gain the upper hand on a massive wildfire burning in the mountains east of Sacramento, officials said Friday. Gov. Jerry Brown launched a statewide campaign Friday — not for his own re-election, but for a pair of state ballot measures that he said were critical for both California’s economic and environmental future. … He called Prop. 1 “the first real integrated water plan” to come before voters since his late father, Edmund “Pat” Brown, was governor in the 1960s. U.S. Interior Secretary Sally Jewell and other officials on Saturday marked the 50th anniversary of power generation by Glen Canyon Dam, a structure that helped usher in a new era in the Southwest. 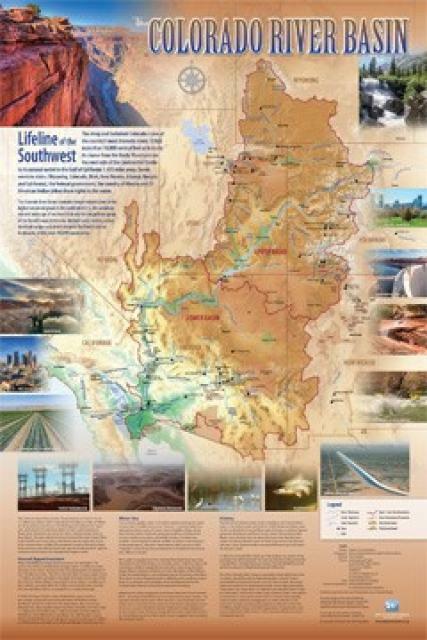 Redesigned in 2017, this beautiful map depicts the seven Western states that share the Colorado River with Mexico. The Colorado River supplies water to nearly 40 million people in Arizona, California, Colorado, Nevada, New Mexico, Utah, Wyoming and the country of Mexico. 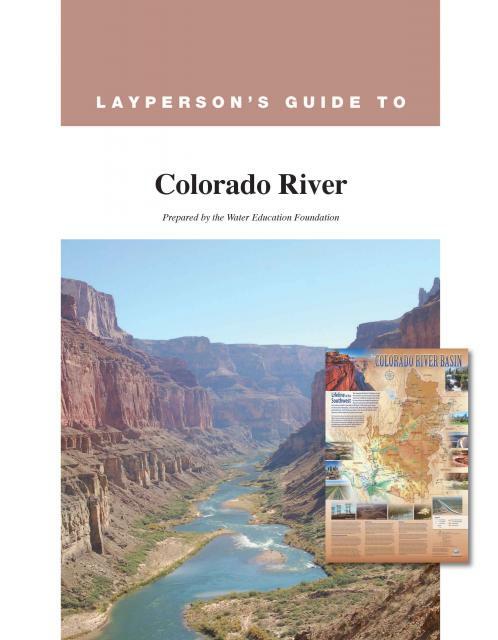 Text on this beautiful, 24×36-inch map, which is suitable for framing, explains the river’s apportionment, history and the need to adapt its management for urban growth and expected climate change impacts. 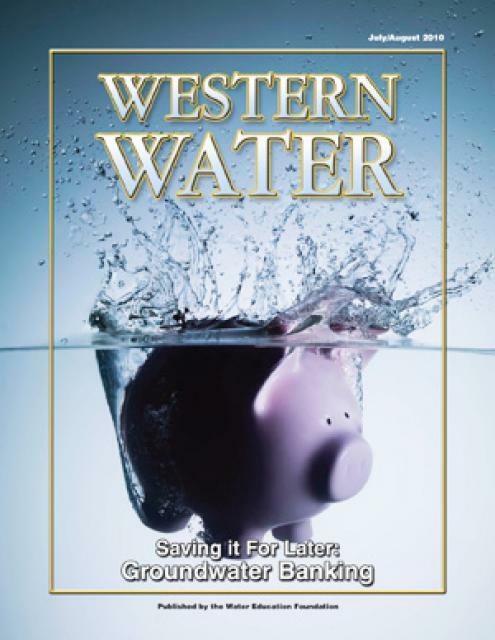 This printed issue of Western Water looks at how water use is paid for and the push to make public financing more flexible. 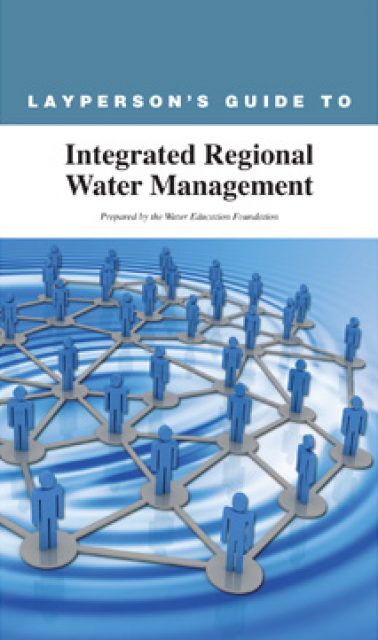 Are We Keeping Up With Water Infrastructure Needs? This printed issue of Western Water examines water infrastructure – its costs and the quest to augment traditional brick-and-mortar facilities with sleeker, “green” features. Everywhere you look water infrastructure is working hard to keep cities, farms and industry in the state running. From the massive storage structures that dot the West to the aqueducts that convey water hundreds of miles to large urban areas and the untold miles of water mains and sewage lines under every city and town, the semiarid West would not exist as it does without the hardware that meets its water needs. 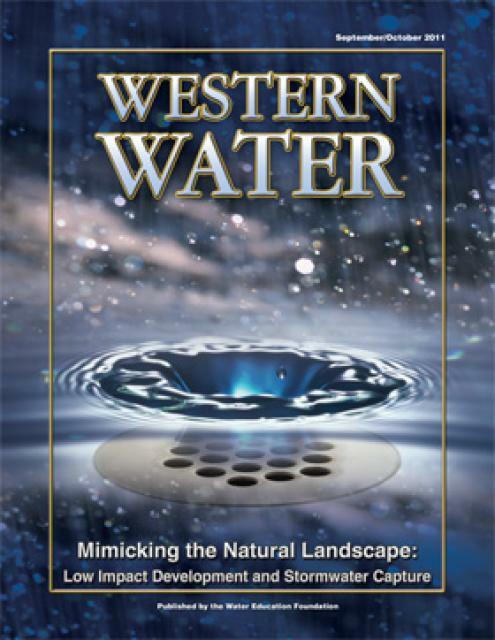 This printed issue of Western Water discusses low impact development and stormwater capture – two areas of emerging interest that are viewed as important components of California’s future water supply and management scenario. 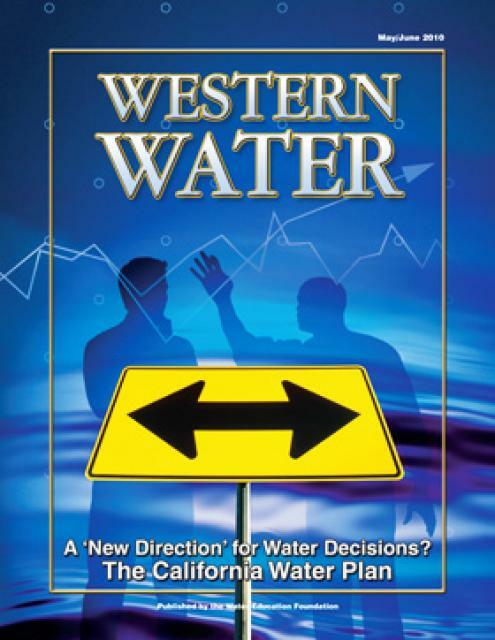 This printed issue of Western Water examines groundwater banking, a water management strategy with appreciable benefits but not without challenges and controversy. 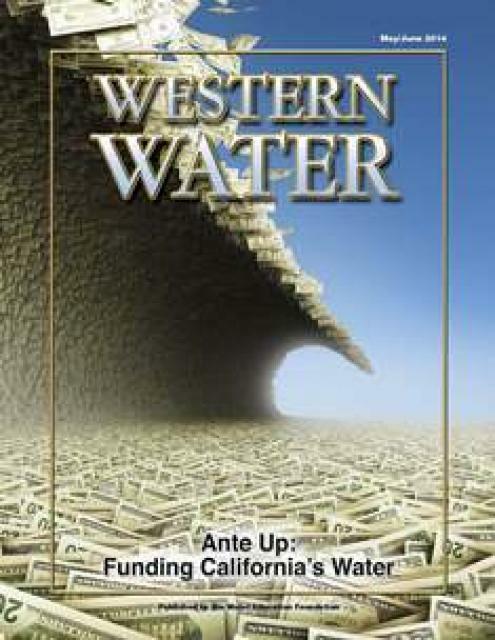 This printed issue of Western Water examines the changed nature of the California Water Plan, some aspects of the 2009 update (including the recommendation for a water finance plan) and the reaction by certain stakeholders. 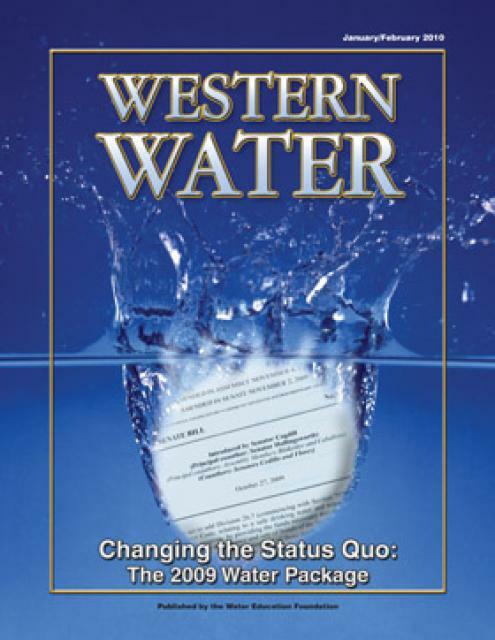 This printed issue of Western Water looks at some of the pieces of the 2009 water legislation, including the Delta Stewardship Council, the new requirements for groundwater monitoring and the proposed water bond. It’s no secret that providing water in a state with the size and climate of California costs money. The gamut of water-related infrastructure – from reservoirs like Lake Oroville to the pumps and pipes that deliver water to homes, businesses and farms – incurs initial and ongoing expenses. Throw in a new spate of possible mega-projects, such as those designed to rescue the ailing Sacramento-San Joaquin Delta, and the dollar amount grows exponen­tially to billion-dollar amounts that rival the entire gross national product of a small country. 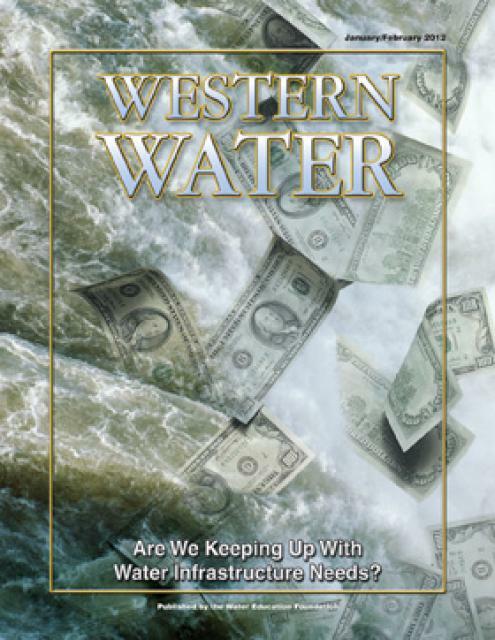 This printed issue of Western Water examines the financing of water infrastructure, both at the local level and from the statewide perspective, and some of the factors that influence how people receive their water, the price they pay for it and how much they might have to pay in the future.